If you would like a few unique close-up images, just keep your eyes looking upwards into the leaf canopy of the trees on a sunny day. Most macro photographers are to busy scanning the ground for subjects while all kinds of these macro shadows are waiting to be photographed overhead. Because many of these subjects are fairly high up on the trees, you will need a longer focal length macro lens, like the 180mm range or you can even shoot these with a normal zoom lens like my Tamron 18-270, or a 70mm - 300mm. At 300mm you will be able to reach out a good distance. While you're out walking through the woods searching for your macro subjects on the ground on a sunny day, keep scanning up into the tree watching for shadows. 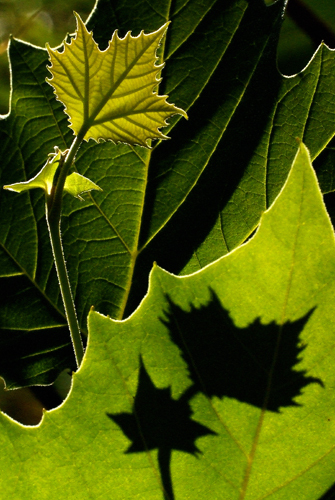 This first image is of a nice alignment of Sycamore leaves. I spotted the shadow on the large leaf, and then looked up a little higher and saw the small leaf that was creating the shadow. The small leaf also had some nice backlighting which made the veins pop. 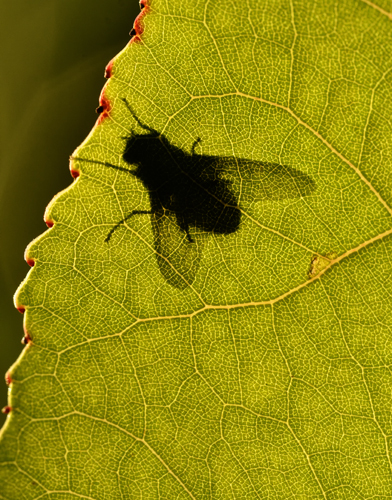 I was walking a trail one early morning and the low angle sun created this silhouette of a fly sitting on this leaf. 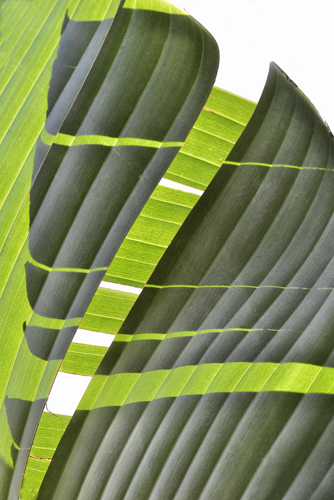 Here is a great abstract of two "Birds Of Paradise" leaves that was produced by early morning sun creating highlight and shadows from one leaf onto the next. 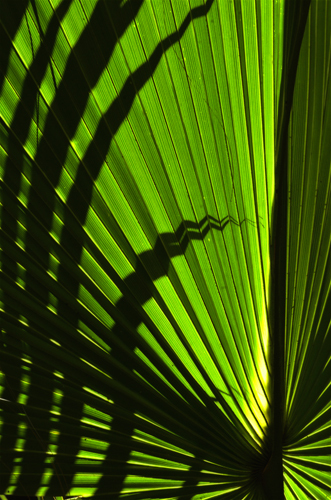 Here is a nice shadow of two Palm leaves.